The first week of school is one of the most crucial weeks of the school year. You are getting to know the students, but you also have to hit the ground running with establishing procedures, expectations, and developing a great classroom community. Over almost a decade in the classroom, I have found myself coming back to the same core lessons that seem to have the most impact for my students. *This resource is also a part of my bigger Back to School BUNDLE. 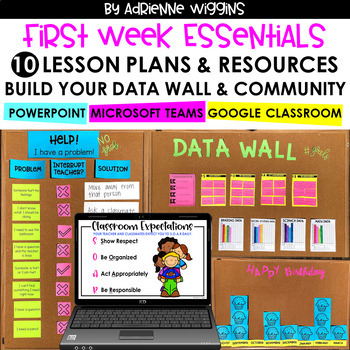 This resource includes 10 lessons for the first week of school. There are 81 pages total. Download the preview to get a better look at the lessons and resources attached to each lesson. 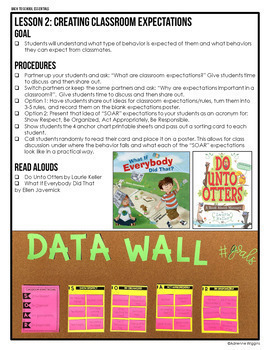 The focus of these lessons is building your classroom data wall. The focus of these lessons is building your classroom community. Each lesson page includes goals for the lesson, step-by-step procedures, and suggested read alouds. Photos of completed activities and covers of read aloud books are also included. Each lesson comes with the resources needed to complete the activitiy. 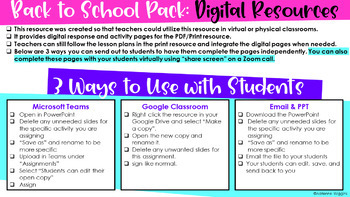 These lessons were designed to go hand in hand with ⭐ Data Notebooks which also can play a big role throughout the first week and establishing expectations.